A half sheet cake, or 1/2 sheet cake, is a large rectangular-shaped cake that is normally served at a party or any time a crowd is expected. Because of the difference in available pan sizes, half sheet cakes come in a variety of sizes. A half sheet cake from a bakery is often larger, and serves more people, than a typical sheet cake baked at home. A half sheet cake from a bakery can measure 15 inches by 11 inches, 15 1/2 by 10 1/2 or 16 by 12 inches. Unless a special half sheet pan is used, the typical sheet cake baked at home measure only 13 inches by 9 inches. A bakery-size half sheet cake typically serves between 18 and 40 people, depending on the size of the slices. 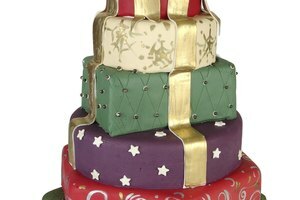 A 13 inch by 9 inch home-baked cake can serve up to 18 people. It is much easier to cut a one-layer half-sheet cake into small, neat, equal-size pieces for a crowd than it is to cut a square or round layer cake, which, at most, will serve about 12 people. 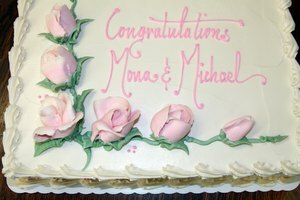 The large surface area of a half sheet cake provides more space for writing and decorating than the smaller surface area of an 8-inch or 9-inch layer cake. A double layer half sheet cake is usually one layer that has been "torted," or cut in half horizontally, but it can also be two layers stacked, which will yield more or larger servings. 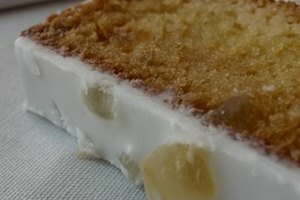 Half sheet cakes are available in the bakery department of most large supermarkets as well as in bakeries. 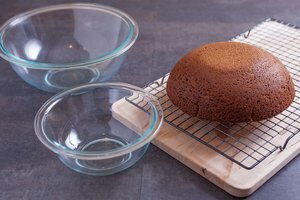 Professional-size half sheet cake pans are available in the cookware department of major department stores and in specialty cookware shops. 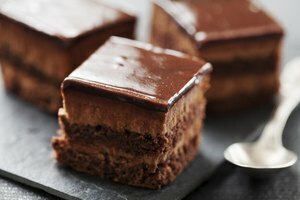 Hurry Up Cakes: How many people does a sheet cake serve?